Tarboosh Lebanese Cuisine is as good for you as it is delicious. The menu is rich in traditional foods from the Mediterranean. For example, lean grilled meats and savory sauteed vegetables steaming on a bed of tender long grain rice. This is the type of food that builds the body and feeds the mind; and along with a nice cup of Arabic coffee and a light desert, you have the perfect business lunch. See the menu pages for a look at other delectable treats to satisfy your palate. You may choose to dine inside or outside. There is a relaxing, oasis-like ambience out on the heated patio. While outside, you may also have a smoke and/or try a flavored Hookah. For Dinner, bring friends and family for a beautiful family style feast. We suggest starting with some nice Mazzas (traditional appetizers) and, for a main course, the very popular and filling mixed grill featuring three different Kabobs, and all the trimmings. Or, for the seafood lover, our fresh seafood grill is a delicacy your taste buds will savor until your appetite is vanquished. Of course, save room for those heavenly deserts. It's well worth it. Now, a word about our friendly family atmosphere. True, the food is fabulous, but the care taken buy the warm friendly staff to ensure a pleasurable night out is the specialty of the house. From the passion of the Chef as he prepares each dish, to the way the staff smiles as they greet you, Tarboosh is an uplifting experience in your busy life! We can all use a little "TLC" from time to time. In traditional fashion you will be able to take your time and enjoy your meal, a refreshing experience in today's hurried world. 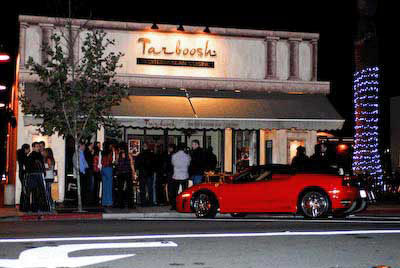 The special dining experience Tarboosh is famous for takes place on Friday and Saturday nights. Come late, stay late, enjoy the total experience of Mediterranean Culture. All of your senses will be aroused with the sights, sounds, aromas, and tastes of one of the world's most fascinating cultures. After 9:30 p.m. Tarboosh comes alive with exotic Belly Dancers, Live Music, top-shelf drinks, Hookah, and you can indulge in what your appetite desires. We welcome all, but a reservation is highly recommended to ensure the seat of your choice.